Texas Instruments TI-83 Graphic Calculator. Good working condition. Sling Shoulder Case For Nikon D7100 D7200 D7000 D5300 D5200 D3300 D3200 D3100. Aluminium Binocular Tripod for Celestron TRAILSEEKER 8X42 | SGODDE 16 x 52 kourosh8907(270). Black EVA Protective Headphone / Earphones Carry Case And Cover W/ Netter Pocket. There is a minor scratches on the screen. Batteries included. Type Graphing. 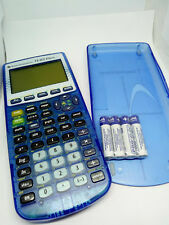 Model TI-83 Plus. Power Source Battery. MPN TI83PLUS. P/N: 83PLTPK1L1E. MPN: 83PLTPK1L1E. TI-83 Plus Teachers Kit Graphic Calculator Graphing TI83 Teacher. The TI-83 Plus is an easy-to-use graphing calculator for math and science that lets students graph and compare functions, as well as perform data plotting and analysis.